Ure-Tech is an innovative 2-component polyurethane low sheen finish designed for hospitals, healthcare facilities and food processing plants where frequent cleaning with harsh chemicals is commonly encountered. Ure-Tech is formulated using BayhydrolÂ® HD Wall Coating Technology from Bayer Material Science Co. 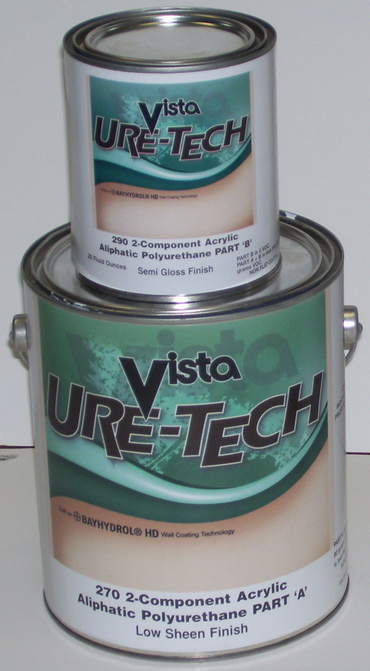 This advanced technology has allowed Vista Paint to formulate an exceptional abrasion resistant coating with very low VOC. Ure-Tech is virtually odor free, will not yellow and offers both interior and exterior durability. Recommended Uses: FOR PROFESSIONAL USE ONLY. See Product Information Sheet for details.